Toddlerhood is a well-defined and distinct stage of human development. 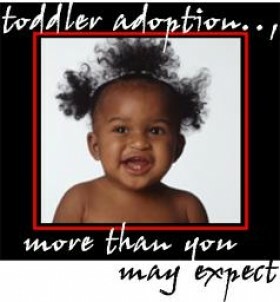 Yet, the available adoption literature talks primarily about infants and older children. Therefore, many prospective adoptive parents assume that a toddler is little more than an infant, eagerly awaiting parents with whom to bond. And as such, the child is unencumbered by conscious memories of other parents and unaffected by months or years of neglect or other abuse. 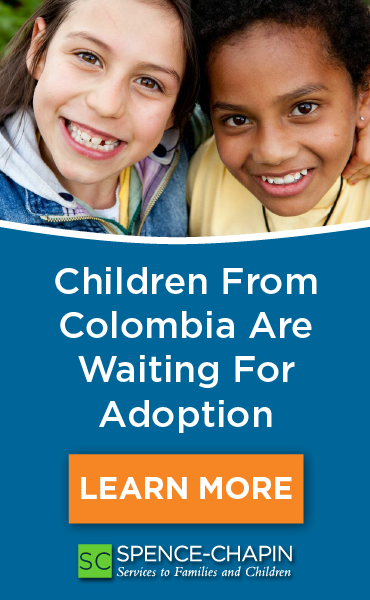 Many hope that toddler adoption will help them avoid the demanding baby stage, or that a toddler will become an immediate playmate for older children. Parents and professionals alike often happily embrace the popular theory that with proper love and good behavior management, the toddler can quickly overcome previous trauma and attach to the family. While some do quickly adjust to their adoptive families, many parents have found that their toddlers display intense anger and grief, aggressively reject their adoptive parents, are hypersensitive to stress, and quickly revert to their own hard-earned survival tactics-even after they're firmly attached to their new parents. Toddler adoption presents unique rewards and unusual challenges. It's time that parents and professionals acknowledge that specific preparation techniques, transition strategies, and special parenting approaches are needed to help toddlers adjust to their new families. Most toddlers have acquired a sense of humor and rudimentary communication skills. The developmentally normal toddler displays an emerging sense of autonomy and has acquired an impressive array of physical skills. However, many also arrive with an array of challenging behaviors caused by early neglect, abuse, or multiple disruptions in caregivers. But unlike older children, toddlers are unable to participate in the preparation, transition, and therapeutic strategies typically used with older, more advanced children. Toddlers are a bundle of contradictions. Many keep their adoptive parents at bay through their anger, grief, and natural urge toward independence. Encouraging a newly adopted toddler's dependence and trust while supporting his emerging independence is a confounding task for both the child and parent. Communication skills often suffer a setback, and may be forever affected by changes in a child's primary language. Even domestically adopted toddlers must adjust to different communication styles and expectations. Comfortable routines, all-important to the toddler's sense of security, often disappear with an adoption. More devastating than a change in routine, many toddlers are unceremoniously and abruptly moved from one setting to another. Not surprisingly, they conclude that they are powerless to prevent caregivers from magically appearing or disappearing at will, so they resist attaching to new caregivers. Parents who make a deliberate and informed decision to adopt a toddler are generally better prepared to respond to their child's special needs. Also, the most satisfied toddler adopters believe in the rightness of their adoption. Parents who carefully prepare their home, head, and heart for a new toddler feel more entitled to parent their child. Important groundwork includes toddler-proofing the home, enlisting the support of family, friends, and other adoptive parents, and preparing siblings. A gradual and planned transition helps resolve grief allows for transference of attachment, and assists development of healthy attachment toward the permanent parent(s). In the ideal situation, toddlers are introduced to their new parents via pictures, letters, conversations, and pre-placement visits that allow a gradual transfer of care from the former caregiver(s) to the adoptive parent(s). Toddlers need to witness the former caregiver's permission and support for the role their new parents are assuming to shift their love and loyalty without feeling guilt. Caregivers can prepare toddlers for their adoptions by marking time until adoption in some concrete manner, introducing new routines, reading books about adoption, and using language to reinforce the pending adoption. Transition objects---those items that children take with them from one setting to another such as a toy or blanket---provide a sense of comfort and continuity to the toddler. A child's bedding, toys, and familiar clothing should accompany them whenever possible. A Lifebook can also be used during and after placement to help the adopted toddler connect his past and present life. Post-placement visits assure the toddler that his former caregivers still exist, provide further evidence that his caregivers are supporting his adoption, and allow him to gradually transfer attachment. Adoptive parents will want to have at least a rudimentary knowledge of the developmental tasks of toddlers so they can respond appropriately to their child's behaviors and plan activities that stimulate their development. Children need to be parented according to their developmental age, which may not correspond to their chronological age. Many adopted toddlers display acute grief during their first weeks and months at home, seen in crying, withdrawal, poor appetite, seeking behavior, sleep difficulties, fear, or infantile behaviors. Acknowledging and supporting their child's grief is one of the first acts of love adoptive parents can give their new toddler. Grieving toddlers should be supported in their need to grieve the loss of former caregivers. Offering well-known food and maintaining a familiar routine is comforting. Accommodating a grieving toddler's need for being fed or comforted in a manner usually reserved for infants also supports the grief and provides a wonderful opportunity to develop attachment. Attachment issues are central to literally every toddler adoption. If the toddler has enjoyed a secure attachment, the parents must support her through the task of transferring her attachment to her new caregivers. However, if the toddler has not experienced a secure attachment, the parents will be confronted with the challenging task of building attachment. Attachment problems are indicated by developmental delays, resistance to being comforted and cuddled, ambivalent or rejecting behavior toward parents, raging and aggressive behavior, extremely negative and controlling behavior, unorganized play, absent or extreme separation anxiety, and premature independence. The number of disruptions and the manner in which those disruptions occurred has a significant effect on the toddler's resistance or responsiveness to attachment strategies. Other factors that affect the attachment process include how long and when children experienced inadequate parenting, prenatal conditions, and individual characteristics of the child. Parents feel more secure if they focus on their role in fostering attachment and celebrate progress in that direction, no matter how slow it seems in developing. To create the attachment cycle with newly adopted toddlers, parents must initially provide for their child's needs on demand in the same way that parents try to meet the needs of a newborn. Parents will want to establish themselves as the consistent providers of their child's needs. Intrusive strategies such as deliberately regressing to the bottle-feeding state may be needed with a particularly resistant toddler. The holding and eye contact that such feeding provides are strong attachment builders. Parents will also want to be as assertive and persistent as necessary to strengthen attachment through touch, but may need to help the toddler who has shut down his sensory receptors develop tactile awareness. Martha Welch describes an assertive approach to physical contact her book Holding Time (1988). Even while parents are recreating the attachment cycle, they will want to foster their toddler's continuing growth in all development areas...a demanding process that requires a delicate balancing act. Structure and consistency are essential for the newly adopted toddler. Morning, meal, and bedtime routines are especially important. Family rituals are also effective in building attachment and creating a sense of belonging. Family rituals may be as diverse as Thursday-night-pizza, once-a-week family meetings, or "Gotcha" Day celebrations.